Both of these hitting techniques “weight-shift" in similar fashions. At a singular, defined point in time, the techniques dissociate and follow dissimilar paths. The rotational technique becomes circular and rotates around a stationary axis. The linear technique continues moving progressively forward (on a progressively forward-moving axis-lunging?). Linear hitters do not use their total bodies in their swings. Rather, it is a “hands and arms"-type swing. As a rule, linear-type hitters have become the foundation for describing one of my three hitting types: the Singles/Contact-type hitter. Before talking about linear hitting, it is best to define it. “Linear," by definition, means “Of, relating to, or resembling a line; straight." A linear hitter starts with his weight over his rear leg and transfers his weight to a point over his front leg as he swings. It is a straight-line, back-to-front movement. For many reasons, the linear hitting approach was the technique of choice before 1920; the singular, most important reason was that there were no outfield fences at that time. When studying the historical transition of hitting techniques over different time periods, one thing becomes increasingly evident. Any changes made were simply “cycles" during which smart hitters adapted to playing conditions the best they could. As an example, the “Dead Ball Era" was, in reality, just a period during which field design and “dead" baseballs did not reward the batter who drove the ball a long way in the air. Thus, linear type hitters thrived. However, the dominant hitters of that era, Ty Cobb (photo, left), “Shoeless" Joe Jackson, Sam Crawford, Honus Wagner, “Home Run" Baker, et al, clearly used rotational mechanics. As you look at Ty Cobb to the left, this is an action photo as he is at toe touch, just before heel plant and the beginning of his swing-technique. The hands depict a “hitch” he had, but he returned to the universal launch position like 95% of HOF players did. While the concept of hitting “level to the ball" was not in vogue because there were no fences, the dominant hitters, i.e., those that generated the highest number of total bases, did use “torque" and hip rotation to generate their power. The swings of that era were “flat" to “down"—on occasion, even a “chop"—to better take advantage of large outfields and porous infield defenses. Hitting balls in the air in those days was tantamount to failure. It was near impossible to hit one over an outfielder’s head. Most home runs in those days were “gap" line drives which got past the outfielders and just keep rolling. Today, those hitters of yesteryear with their “level" shoulders hitting approach, would be classified as “linear" hitters. 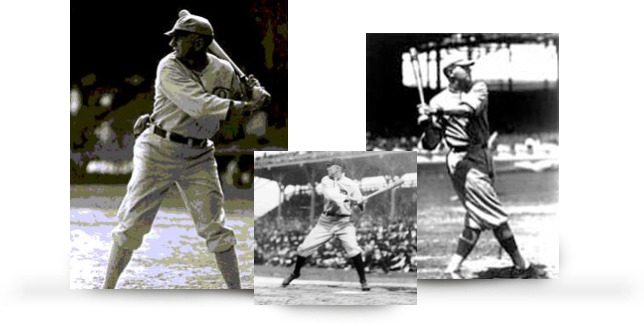 Top linear hitters of this era included Nap Lajoie, Eddie Collins, Tris Speaker, and “Wee Willie" Keeler. The game of baseball in those days was one of strategy, centered on bunts, hit-and-run tactics and base stealing. Not to mention field managers that would water down the area in front of home plate. Most runs were “manufactured" and every run was critical. In 1910, the cork-centered baseball was introduced and the game became livelier and the pace quickened. Babe Ruth came on the scene and single-handedly introduced a whole new style of play with the home run. Fenced-in ballparks took the place of the large open fields. The change in venues helped seal the demise of linear hitting. Starting in 1920, the game would change forever. Or, at least until 1975. 1920–1975: Rotational hitting – Baseball’s “Golden Era"
As discussed earlier, rotational hitting is somewhat similar to linear hitting. As in linear hitting, there is also a “weight-shift" executed in rotational hitting. However, this is where the similarity ends. Perhaps the best way to describe the difference is with an illustration. “Shoeless" Joe Jackson (photo left) is generally credited with being baseball’s first “rotational" hitter. (In those days, it was called “pivot hitting.") He was considered the first “average and power" hitter of the twentieth century. I don’t think there is any question that had he not been expelled for allegedly gambling from major league baseball at the tender age of 31, that the numbers he put up in his career would be even more eye-popping. In 1911, Jackson’s first full major league season, he hit .408. Military service interrupted his career in 1918 and the Black Sox Scandal ended it after the 1920 season. In his nine full seasons, he averaged 190 hits and 60 extra-base hits. His .356 lifetime batting average was lower than Cobb’s (.367), but his slugging percentage of (.518) was a few points higher. In 1920, he hit .382 with 12 home runs and a .589 slugging percentage. Had he not been banned from baseball, his power numbers would have been even more impressive. His hitting technique and his fluent style at the plate caught the eye of a young Boston Red Sox rookie named Babe Ruth (photo, below left) around 1915. Over time, Ruth emulated Jackson’s hitting movements and perfected them. As he became more proficient with the rotational technique, Ruth’s production numbers and power soared. By 1918 he was hitting 11 home runs a year. In 1919, 29. And, in 1920, he hit 59. This figure totaled more than the rest of the clubs in the American League combined! One of the most enduring things I have found in all my years in baseball is that it is a “copy cat" game. The “best" hitter will be emulated by the other players. A few years ago, it was Barry Bonds. Today, it is Albert Pujols, Josh Donaldson, Miguel Cabrera and in 1920, it was Babe Ruth. Interestingly, all players who are emulated seem to be power hitters. Maybe it’s just me, but I cannot ever remember the hitting mechanics of a singles/contact-type hitter being something that others have wanted to copy. Perhaps it’s too difficult to learn, not aesthetically pretty to the eye, or just not productive. My gut feeling is it’s because most hitters want to be run producers. Ruth’s hitting dominance captivated his peers—and the fans. Attendance skyrocketed as more and more fans turned out to watch his towering home runs leave the ball park. And, as Ruth continued his hitting supremacy, more and more players emulated his hitting movements; they also wanted a piece of the action and glory. Baseball was now heading towards its “Golden Era" of hitting. This era spawned the likes of Gehrig, Foxx, Ott, Hornsby, Greenberg, DiMaggio, Williams, Mantle, Aaron, Mays, Yastrzemski, Frank Robinson, and Harmon Killebrew. It continues today with Story, Murphy, Arenado, Davis, Stanton, Bogaerts, Pujols, A-Rod, Altuve, Pedroia, Correia, Posey, et al. All are rotational hitters. When you look at the names of the linear hitters mentioned earlier, Nap Lajoie, Eddie Collins, Tris Speaker and “Wee Willie" Keeler, you may shake your head and say, “Never heard of them." But we all recognize the names of the rotational hitters. The above-mentioned hitters read like a “Who’s Who" in baseball. Why? Simply, because people remember the dominant hitters. They identify with them. These players produce the runs, make the money, and grab the headlines. And, guess what? : they all shared a common technique. Their hitting approaches were all rotational. The current hitting “cycle" began changing in 1995, but unfortunately, many coaches have not responded to hitting’s changing conditions. Astroturf, diving into pitches, getting the weight to the front side, and swinging down, are now dinosaurs of the past, or at least should be. In addition, we’ve got minus-3 alloy and composite bats to contend with, which make it more difficult for hitters to use linear, hands-and-arms mechanics. The weight-to-length ratio does not lend itself to hands-and-arms mechanics. The biggest problem confronting today’s hitters is that the coaches and instructors are a product of this past generation. As a result, many teach what they learned when they played and/or repeat what they have heard. Mostly, it is because they don’t want to learn about rotational mechanics, but some are simply lazy or don’t care. The players pay for this indifference. It’s “back to the future"
We’re in a “new-old" age of hitting now. We’ve gone back to pre-aluminum bat mechanics, back to the days of baseball’s “Golden Offensive Era" (1920-1970), and the upsurge in hitting at the major league level has been breathtaking. Once again, smart hitters and coaches are capitalizing on baseball’s changing conditions. The outfield dimensions in today’s ball parks are much smaller, hitters are considerably bigger and stronger, infielders are more agile and athletic than ever, equipment is better, the height of the pitchers’ mound is lower, the baseball is “livelier," and the strike zones have been reduced to “postage-size" dimensions. There is no other technique that can take advantage of all these hitter embellishments than rotational mechanics and is the reason why the hitting world is in transition. Rotational hitting is all about high total bases. It isn’t just about hitting home runs, but more about power (as in hitting the ball “hard"), and producing runs. As coaches, players and instructors, we must be able to see and understand the changes taking place today, because the players already see them, are emulating them, and reaping the benefits these new venues now offer.